So today is the day I finally announce my Valentine’s Day giveaway!!! Sorry this has taken so long. I guess that what happens when your whole family is sick, but I hope we are all on the mend, and on our way to being back on track. Today I finished sewing this pillow, and I am happy to announce that it will be my next giveaway! I saw this idea on pinterest and thought it would be fun to try. 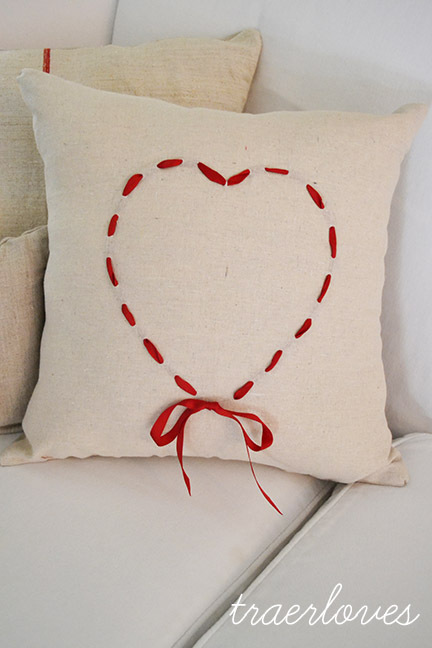 It really was pretty easy to make, and looks cute on a couch for a little valentines touch. So here is how the giveaway will work. I love making new friends so I thought I would try to get 25 more likes on my Traer Loves Facebook page. Share this giveaway with your friends and help me reach my goal! The winner will be chosen from my Traer Loves Facebook friends at noon eastern time on February 14, 2013. And don’t forgot to sign up on my blog to receive my post via email. I just need 57 more people to reach my goal of 100! I have way too many projects going on right now to give you all the details, but I will be taking pics and posting those soon. I will also be working on tutorials as well. They are taking a bit longer to put together than I realized, but I want to make sure they are the best they can be. I hope your week is going well, I know mine is. Good luck! I hope this pillow comes to live at your house soon! P.S. I will ship this to the winner if out of state/country! This entry was tagged giveaway. Bookmark the permalink. 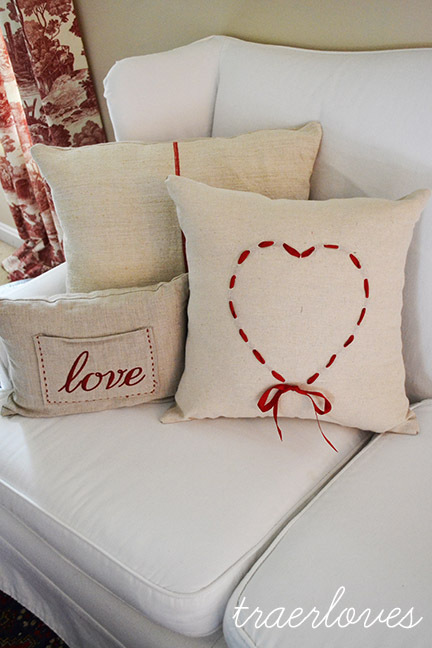 Very cute and simple Valentine décor. Awesome! Thanks for the opporunity!